Florence damaged the coast with storm surges, but farther inland the worst was yet to come. Days after Hurricane Florence tore through the Carolinas, torrential waters are still wreaking havoc on the region, far away from the coasts that bore the initial brunt of the storm’s wrath. Though the storm surges and lashing winds we see on TV are dramatic, they’re only the first half of the story. These coastal hazards happen during the hurricane, when the storm is directly overhead. 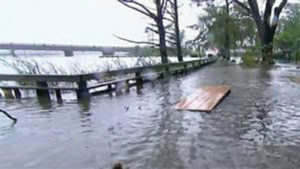 But days later, new floods can occur farther inland, even as waters recede along the shore. Craig Colten, a geographer at Louisiana State University, notes that the eastern seaboard of the United States is particularly susceptible to this phenomenon because the Appalachian Mountains lie not far inland, and the rolling peaks provide a perfect spot for clouds to coalesce and drop massive quantities of rain—and then their valleys provide the perfect channels for all that water to flow down towards the ocean. 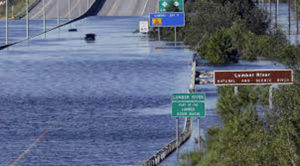 Rivers can’t handle this sudden deluge, and so often the downstream cities and towns experience flash floods as a bolus of water overtops riverbanks and spills out of creeks. You can see the phenomenon a little better in this graphic. It’s a selection of U.S. Geological Survey water gages situated in rivers in both North and South Carolina. Not every section of every river floods in the same pattern, but most experience their peak height well after the storm has battered the area. (You can even see one gage towards the bottom right that broke halfway through the flood and stopped collecting data). Florence, like Harvey in Texas last year, had more inland flooding problems because the hurricane stalled over land, allowing rain to fall over a concentrated area. As of Monday afternoon, Weather Underground noted that at least five all-time records for river crests had been established in Florence’s wake and many more are set to make history. Both Carolinas also smashed the records for total rainfall during a tropical cyclone, and that’s on top of cities like Wilmington, NC, having their wettest year on record—even before the storm. 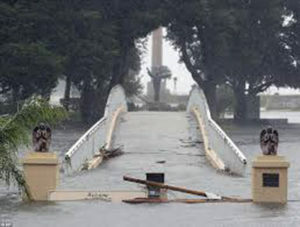 The city got completely cut off from the rest of the mainland by waters too deep to drive through, and though roads reopened on Monday, many had to shut down again as rivers overflowed. All of this was despite Florence getting downgraded to a category 1 storm just before making landfall. Hurricane categories are, just as a reminder, only related to wind speed—torrential rains and destructive storm surges have nothing to do with it. Unfortunately for both inland and coastal towns, torrential rains are becoming increasingly common. Storms during the 2010s had nearly 50 percent more 1-in-5-year events than did storms in the early 20th century, and that including hurricanes. Tropical cyclones pick up more water when oceans are warm, and as sea temperatures rise due to climate change. That means increased precipitation during hurricane season. And that means more storms like Florence.